What is the best weather station? A full-fledged weather station displays not only the temperature, humidity, and atmospheric pressure, but also the wind direction and speed, solar radiation as well as other data. However, if you do not need this amount of information, it would be wise not to pay the extra money for more expensive feature-packed models. Cordless battery-powered options are more convenient to use, so are the models with backlit screens. It should also be weather-resistant and have a transmission rate of no less than 300 feet. In our assessment, La Crosse Technology fits all these criteria best. Why have we chosen this model? It is both affordable and informative. The station monitors temperature and humidity not only indoors but also outdoors. There are such useful features as temperature alerts and a remote sensor. A stylish functional model for a moderate price! The gadget’s display includes 6 icons telling you whether it is sunny, cloudy, rainy or snowy. In the market for a weather station? We’ve tested all kinds of weather stations at every price point to determine the best and the most reliable weather stations on the market to help you choose the best device for you or your family. 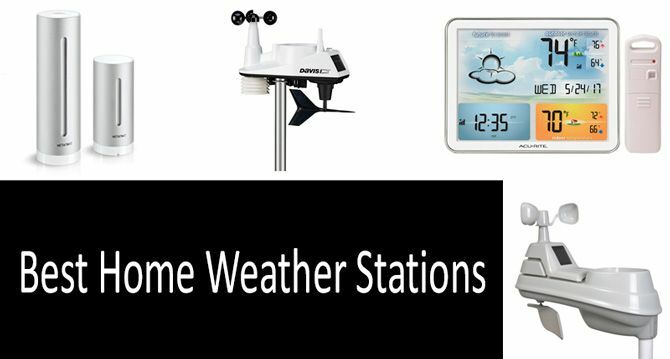 Today, we’re going to learn how this technology works, different kinds of stations in use, important features to look for, and, of course, take a good look at some of the best weather stations on the market. Read to discover the TOP 8 Best Weather Stations of 2018. How to Choose a Wireless Home Weather Station? And why on earth does an average person need a weather station? The weather has long been regarded as the quintessential example of something unpredictable and random. In fact, in the early days of computing, one of the main goals of tracking multiple parallel values was in hopes to properly predict the weather five to ten days in advance. Well, that certainly didn’t work out, but computers have, in turn, made tracking and forecasting the weather far easier and more accurate over the years. Once upon a time, the best weather readouts you could get were from the news, simple rain gauges, weather vanes, barometers, and thermometers. These worked well enough for hindsight, and a real-time gist of climate and meteorological conditions, but that’s just not the same. Over time, more advanced equipment made it possible to track the weather digitally, and with the advent of smartphones and broadband computer connections, things changed. Apps and feeds could provide real-time feeds from meteorological stations, giving you a decent view of local weather over a large area. This doesn’t suffice in some cases, though, and more accurate weather readings and forecasts might be preferred. This is where home weather stations can come in handy, and thank goodness, there are plenty to choose from nowadays. In this guide, we’ll cover all types of weather stations on the market, from really simple go-to models to more advanced and sophisticated semi-professional weather stations. So, hop on and enjoy the ride! Pay attention to the following factors when choosing a weather station. 1. Purpose: To what do you need a weather station for? Invest in the cut-rate thermometers if you only need to measure temperature and humidity at home. The most primitive cut-rate items are only equipped with two built-in sensors of the temperature and humidity and will merely outline a general picture. This point follows from the previous one: the larger sensor and the better it works, the more costly a meteorological station will be. A weather station can be acquired at the prices ranging from ~ $9 up to $500, and the prices for the semi-professional weather stations equipped with all kinds of wind turbines, and solar panels, etc start from the $100. Certain weather stations are only outlet-powered. But we prefer the wireless ones: they can be moved around the house to more appropriate locations etc. The wireless devices are powered with a penlight or rechargeable Li-On batteries. Also, don’t forget about the sensor power. They can run on a small round or special solar batteries. There is another option of using wired sensors, but it is not a very sensible investment. You’d better have a weather station that will be protected from insects and small animals. It is even more essential to pay attention to the distance at which the base station receives analyzer signals. The standard signal radius is 30-70 meters. Everything is pretty obvious when it comes to the water and heat resistance: sensors used outdoors must be water and sun-proof. The backlighting, font size, colors, a pleasant interface with widgets, the presence or absence of a projector are all the secondary advantages of a weather station. But they are quite significant for those who appreciate the easy-to-use gadgets. Transmission distance is another important factor that you have to consider when shopping for a weather gadget. The longer the transmission distance, the further away you can place your sensor from the base unit. This might be a crucial and determining parameter if you own a large country house; however, it might also be unimportant if you rent a small apartment in the city. The standard transmission rate is 300 ft. The weather stations can be either battery or solar powered. The solar-powered ones are usually on the higher end of the price spectrum and are recommended in places with unreliable electricity. However, if the weather is more unreliable than the electricity, then you’d better stick to AA batteries. On the downside, you always have to remember to change your batteries on a regular basis; otherwise, your weather station will stop recording data. Another disadvantage of using batteries is that they can leak because of water damage or corrosion, and will eventually damage the sensor unit. The solar-powered stations, on the other hand, have usually a wider operating temperature range and will last longer than regular batteries. Besides most of the modern solar-powered panels will have a backup battery enclosed in case something unpredictable happens with the solar panels. Some of the best weather stations that are solar powered will also include radiation shielding and aspiration fans. However, all the best features will come with an additional price tag. Smart home stations are technologically advanced weather stations that work with Alexa, Google Assistant, IFTTT, and other smart home systems. These smart stations will offer great add-ons to the smart home infrastructure that will help you even better monitor your home microclimate and changes in atmospheric conditions in any part of your house. We’ll start with a basic digital hygrometer & thermometer ThermoPro. It’s very simple, cheap and transmits only temperature and humidity readings. There’s nothing really much to add. But then, we’ll walk you through some of the trendiest gadgets on the market within the price range of up to $100 that would provide you with quality monitoring of weather conditions in different locations. These devices are less prone to errors and equipped with additional sensors. ✔ The remote sensor reads the environment where it is mounted. La Crosse Technology started back in 1980s when one man traveled across the country with a mobile showroom. Since then the company has grown into one of the largest multinational corporations and become a well-know and reliable industry leader in wireless weather solutions. La Crosse Technology S88907 featured in this guide was one of the first weather stations that came with color animated screen, back in the day. Although the functionality of this device is far from impressive, there are certain important features that make this product worth looking into. First, the wireless sensor transmission distance range is up to 300 ft which is far from enough to cover a large house area. Then, the station calibrates barometric pressure based on its location over a period of time to generate accurate and personal forecast. However, you need to allow about a month for the readings to be accurate. Third, it’s the price, as you can buy this for less than 15 dollars. The external sensor measures temperature, humidity, and atmospheric pressure (powered by 3 AAA batteries) outside and thus, needs to be placed outdoors. The base unit (powered by 2 AA batteries) measures the temperature, humidity inside the house, calculates the comfort level of the room based on those readings and displays the result in three modes: humid, good, or dry. Some other cool features include: fully customizable alerts, automatic reset for daylight saving time, alarm functions with snooze, adjustable backlight settings, and fold-out leg stand in case you want to place your station on a table. The customer response to this model was more positive than negative, with a bunch of testers saying it was easy to set and read. Those who didn’t have much of a success with the device said the station was not reliable enough, stopped working after a while, and was perhaps a bit outdated. Thus, it comes as a no surprise, that if you’re a stickler for precision, we’d recommend buying more advanced models. «I set this weather station up about 10 days ago. Great value and functionality. Sets up quickly. I love the fact that the writing is large and that there are three brightness levels. I also love the fact that I can connect to the atomic clock so that the time is highly accurate all of the time». 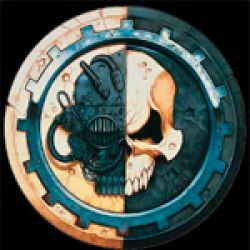 «I have had this product for about 16 months now. Accurate temp. and humidity readings. There's also the added convenience of having both indoor and outdoor temperature and humidity levels, so it's easy to know when the windows can be open to get some fresh air into the home». This is yet another bestseller, which is a bit pricier than the model from La Crosse, but seems to be much more reliable and sophisticated. In case you’re not yet familiar with Oregon Scientific, it’s high time to get acquainted: it’s a huge company that was also started back in 1980s and later became a subsidiary of IDT, a Hong Kong-based corporation. Oregon Scientific was the first company who manufactured the first stand alone waterproof mp3 player. The model featured in this guide would be particularly useful for farmers, gardeners, conservationists, and anyone else, really, who’s in need for a reliable rain detector. In fact, this device has been particularly marketed as a wireless rain gauge and a reliable measurement of precipitation and moisture. It’s extremely accurate in reading the rainfall collection (up to .04 inches). The transmission range from rain gauge sensor falls into a standard distance of 300 ft, whereas the temperature remote sensor transmits up to 100 ft. The unit stores past rain history data for up to 10 days so that you can calculate how much water your lawn/garden has received over time. The consumers indeed purchased this station to watch for rainfalls, determine the amount of precipitation and moisture. While there were many happy and satisfied consumers, it seemed that this particular model had some serious drawbacks that affected its performance over time: in particular, there were testers who reported the model flashing intermittently and not being able to gauge the rain after some time. In case anything like that happens, call Oregon Scientific for instructions on how to perform a hard reset on your item. AcuRite 00325 Home Comfort Monitor is just a great thing when there is a child in the home. It is important for us to monitor the temperature so that the baby does not get sick. I bought the second same station, for my parents. For such a low price, just a great station. Very comfortably! You’re not the first one to ask this question. Yes, this sensor will correctly transmit the signal even when it’s in the fridge, as tested by other inquisitive consumers. Can I place the hanging temperature sensor of AcuRite 02027 Color Weather Station into my fridge to check whether it’s working? 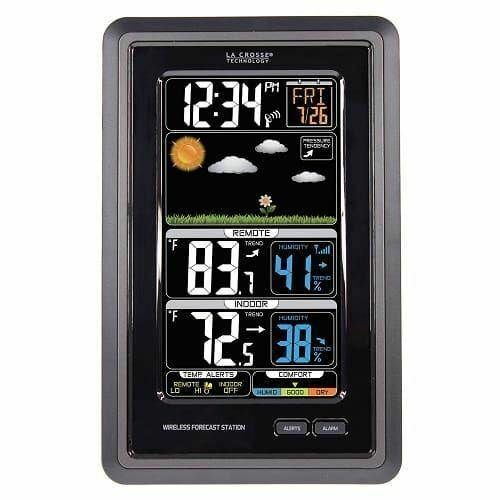 In this case Ambient Weather WS-1171B Wireless Advanced Weather Station is suitable. The BF changes graph is shown at the bottom of the screen. It will help you define whether the headache is correlated to pressure changes and to track trends. Can I use AcuRite 00325 as a hygrometer to monitor the humidity in my guitar case? I get headaches when the atmosphere pressure changes. Does any of the weather stations of this review schedule changes? Ideally, I’d also like to receive a warning of an impending pressure fluctuation.